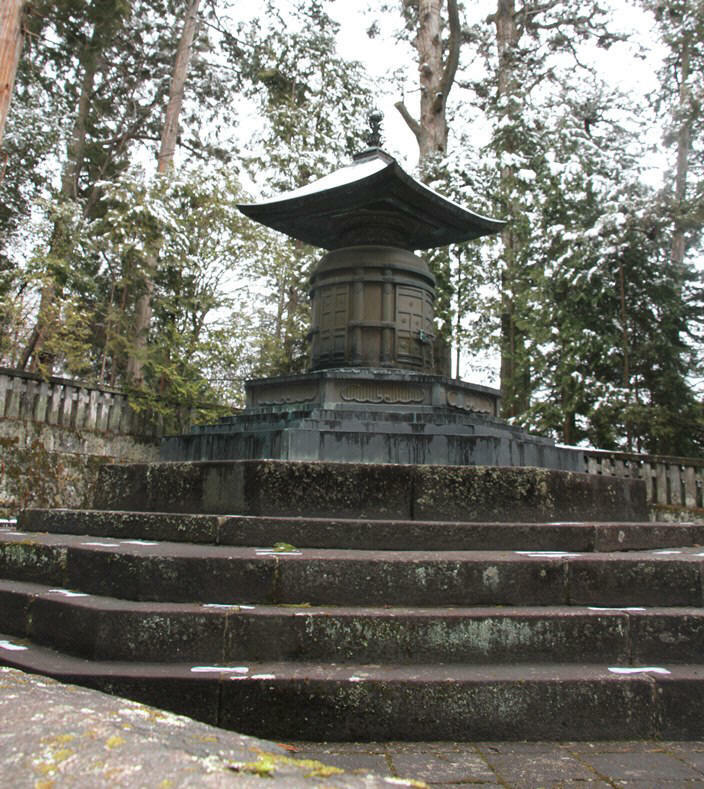 Nikko became popular with the western ambassadors trying to escape the heat of Tokyo in summer. 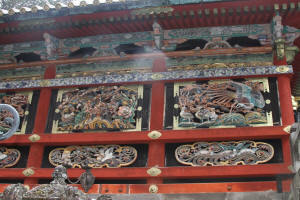 We did two major sites in Nikko: The Toshogu Shrine and the Imperial Summer Palace. 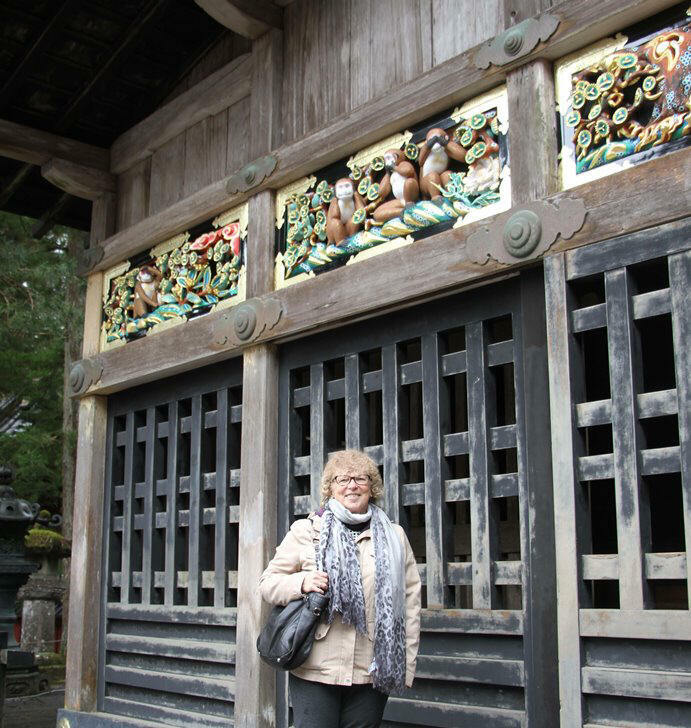 It had just snowed when we arrived in Nikko and everything would have looked calm, had it been prep 21st century tourism. The famous Shinkyo Bridge - The story goes that in 766, the priest Shodo Shonin tried to cross the river but wasn't able to , until, suddenly, the God of the River sent two snakes and he crossed the Daiya river on their backs. 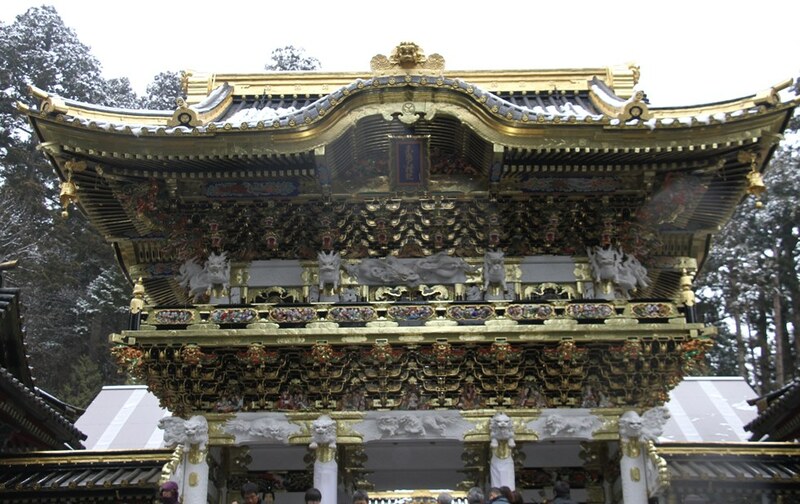 It is the entrance to the shrines and temples of Nikko. 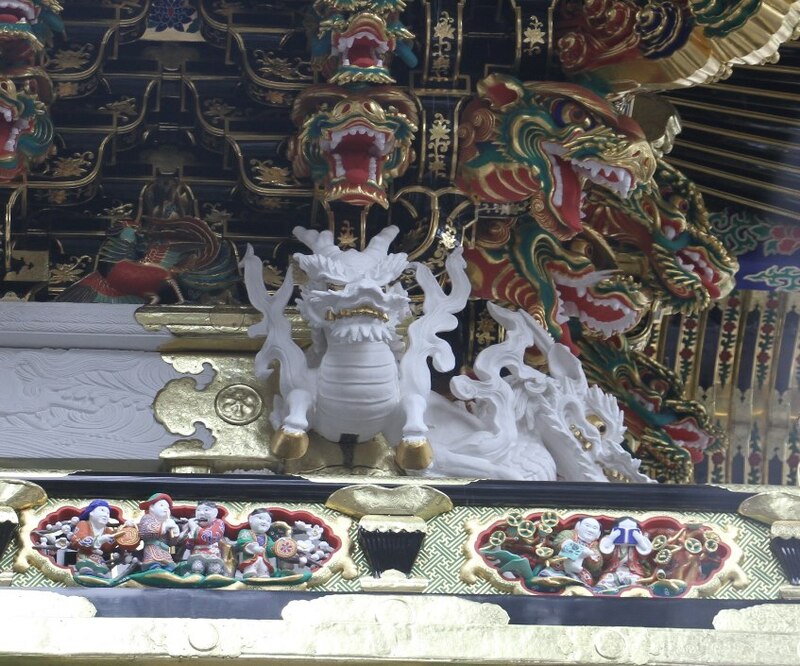 The Tosho-Gu Shrine was rebuilt by Iemitsu, the grandson of the Tokugawa Ieyasu, the first shogun of the Tokugawa shogunate. Iemitsu's parents favored their second son to become shogun but grandpa refused and made Tokugawa Iemitsu heir. So he became the third shogun after his father. 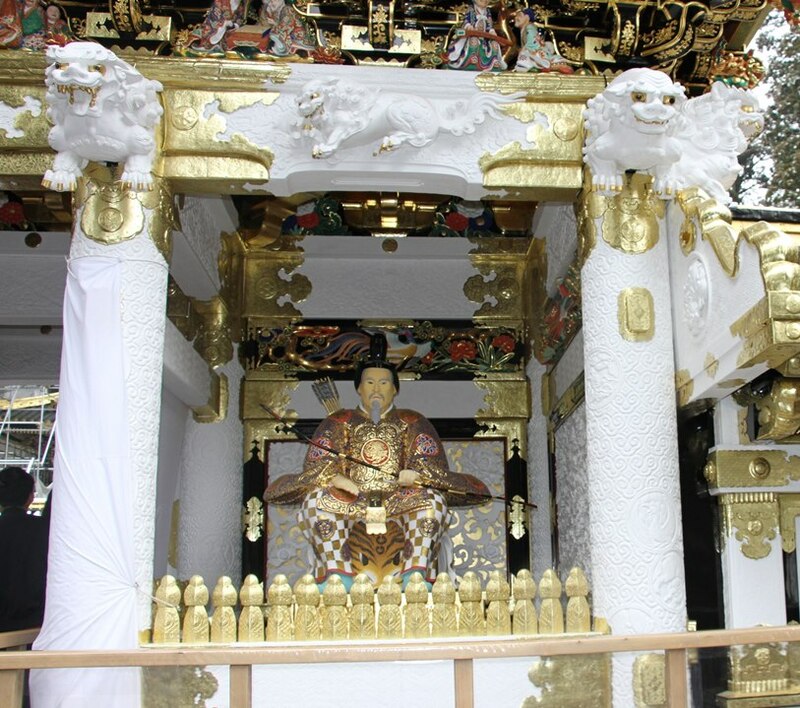 To show his gratitude to his grandfather he made Tosho-Gu Temple, one of the richest, most lavish temples in Japan. Once you enter the Temple you walk several stairs up to the main courtyard. 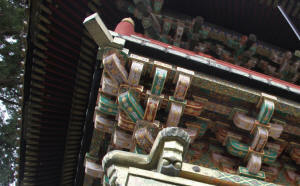 The main Shinto gate [above] & The five story pagoda at the entrance, representing: earth, water, fire, wind and heaven [below]. ... and then it hits you. No wonder it is a UNESCO World Heritage Site. 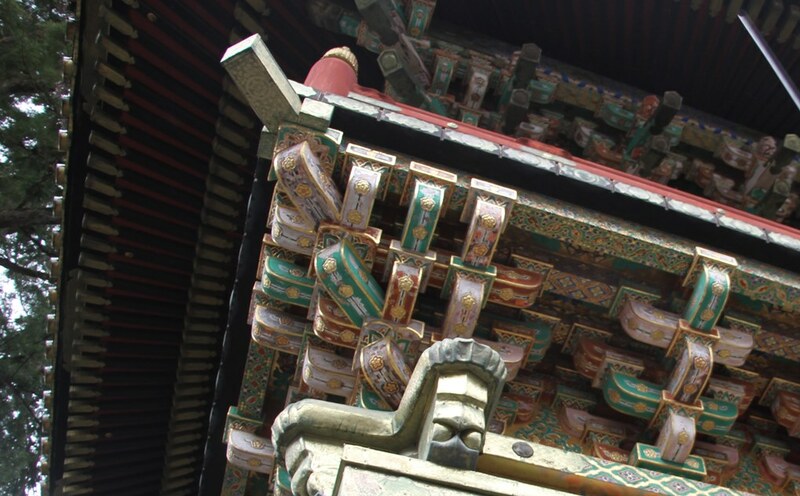 Its beauty, its craftsmanship, its architecture, amazes you and enchants you for hours. Not one square inch of most of the buildings are left raw. 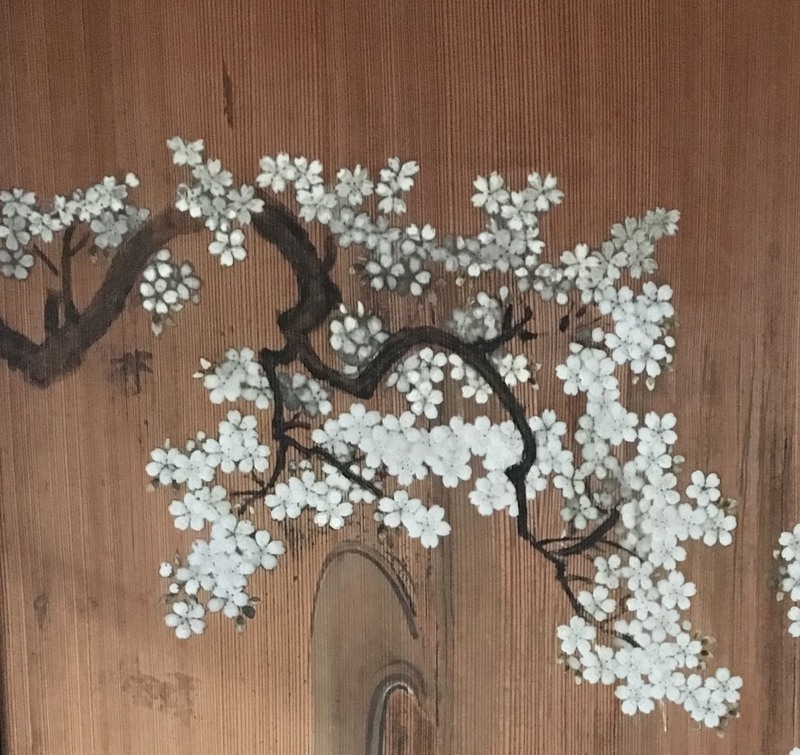 They are carved, etched, painted and gracefully decorated. 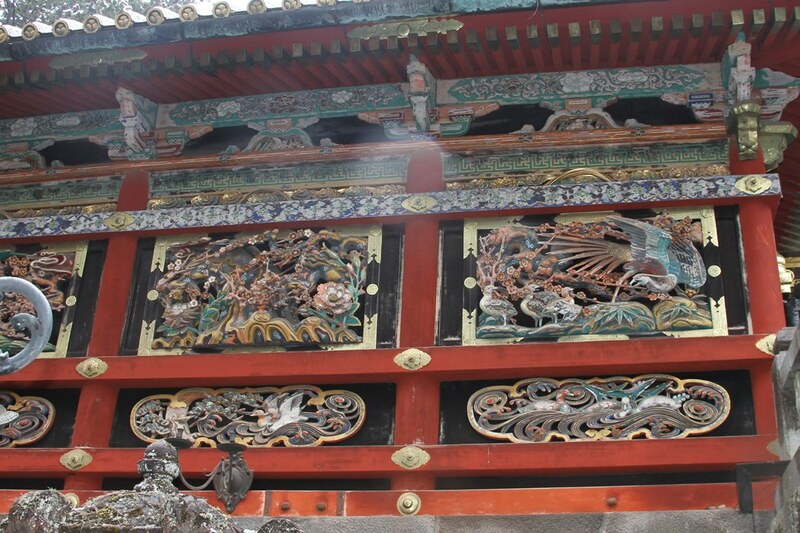 The crest of Tokugawa shogunate is on every building in some form [below]. There are many animal depictions and most have stories. Here are a few. 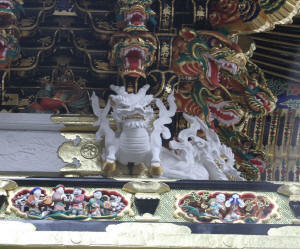 The Sacred Stable is one of the few raw wood buildings but has decorations of monkeys surrounding it. Monkeys were believed to be protectors of horses. The most famous of all depictions is the wise monkeys - See no evil. hear no evil, speak no evil. 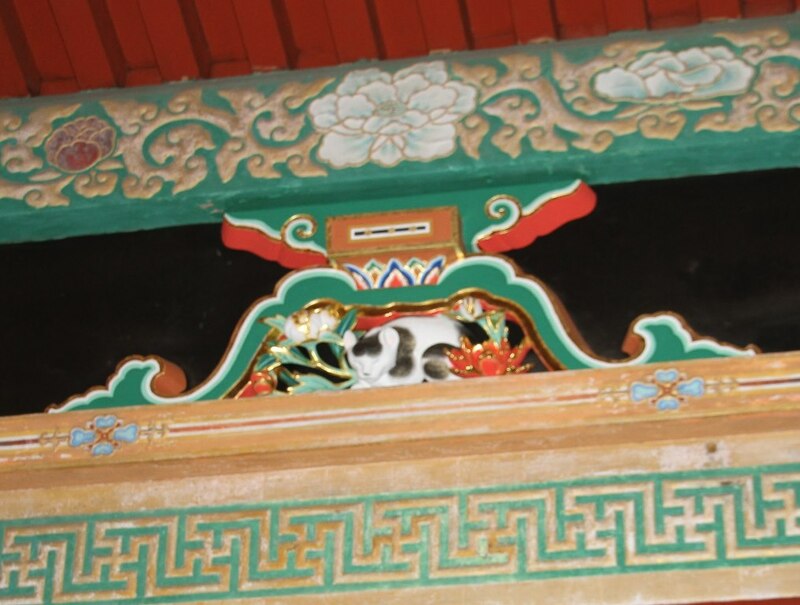 The Sleeping Cat from what I heard has two translations: One is to ward off mice from the grave of Ieyasu [as it is on the way to his tomb] and the second is that a sleeping cat is a symbol of peace. 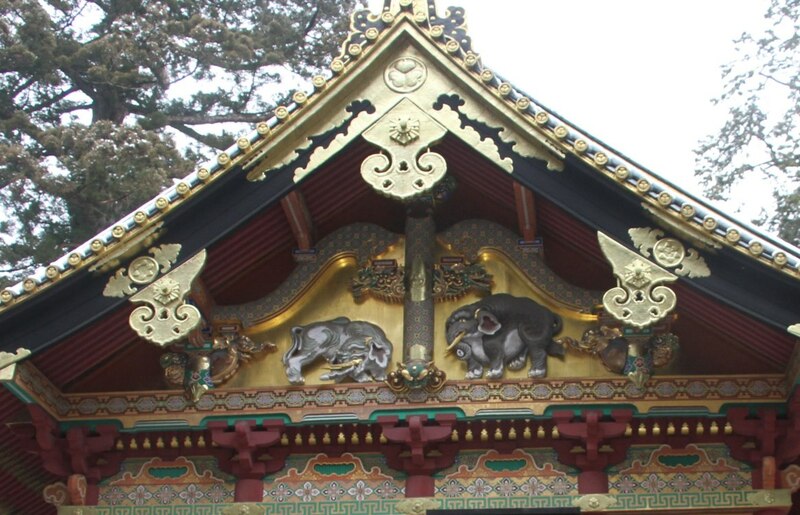 The elephants on a warehouse in the Temple were created by an artist never having seen one - pure imagination. 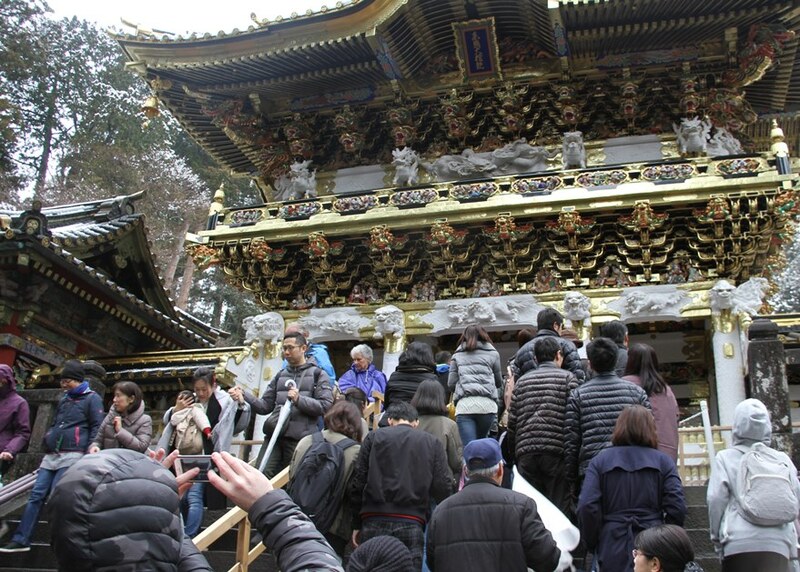 We then walked up yet another set of hundreds of step to reach the tomb of Ieyasu. It holds the urn containing his remains. More details including my wonderful guide. Our second visit of the day was to the Imperial Summer Villa. A combination of classic Japanese and western styles, it is serene and zen-like. The villa has a mixture of carpeted floors as well as tatami flooring, western style chandeliers as as well as sliding paper doors. And last, on the left, the guide in the villa showing us the symbol of Chrysanthemum on a Japanese passport and the decorations on the walls. While the passport has a simplified version the imperial flower is double layered. On the right, the cleanliness of Japanese people. You take your shoes off to visit the villa but in the common bathrooms they provide brand new looking, clean, slippers to prevent any mishaps. Wonderful experience. I will never forget it.